The Smith College Archives document the life of the College by collecting materials created by students, faculty, administrative and departmental staff during the course of their time here. The records in the College Archives can provide researchers with answers to specific questions or help them to understand broad social and cultural issues. The following general groups of records are represented in the College Archives collection, as well as many, many more. Please contact the College Archives for additional information about their holdings. Administrative records provide information about how the College operates. Records from major offices include the Office of the President, Dean of Faculty/Provost, Dean of Student Affairs, Office of the Registrar and others; also, academic department records; and official publications produced by the College. View image gallery. Biographical records provide information about alumnae, faculty and staff. These files often contain photographs as well as newspaper clippings and other biographical materials. View image gallery. Academic life is documented through course notes, examinations, papers, and selected theses that provide information about the changing nature of teaching and the curriculum at Smith. Official catalogues and reports of the President document the content of the curriculum offered by Smith. Faculty papers provide information about their research interests and course development. Records of departmental clubs document extracurricular academic activities of students. View image gallery. Letters, journals, diaries, scrapbooks and photograph albums provide a personal glimpse into the world of Smith undergraduates beginning with the first class of 1879 continuing to the present. Programs, tickets, photographs, and records of athletic, musical, dramatic, and arts events, as well as records of political and social groups on campus, are resources for learning about many of the extracurricular activities of Smith students. Student Government Association records document student governance on campus. Student publications highlight the literary creativity as well as the journalistic passion for documenting life at Smith. View image gallery. Buildings and grounds files contain photographs, architectural and landscape drawings, manuscripts, and other records to assist researchers interested in documenting the growth of the campus, the construction and demolition of buildings, and the activities that took place in these buildings. Files are maintained for all buildings on campus, as well as for tracts of land owned by the College. View image gallery. 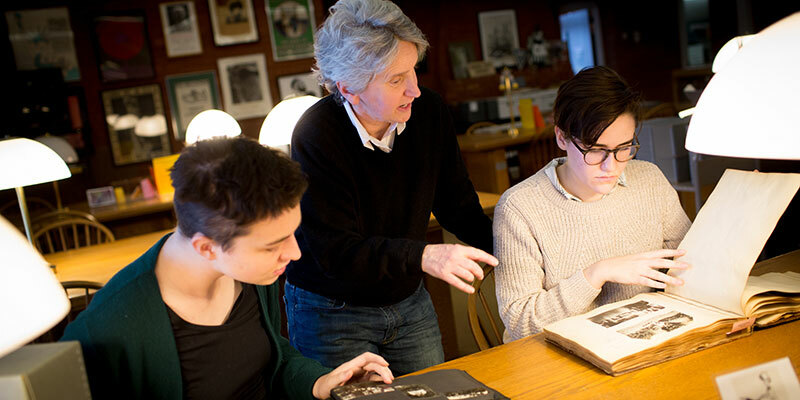 Audiovisual materials add yet another resource to Smith College history. There are photographs, slides, professional and amateur films, tape recordings, long-playing records, CDs, slides, and videotapes available in the College Archives. Whether an Admissions Office film, a homemade videotape of Ivy Day, a recording of an Alumnae College session, or a Glee Club concert, all these and more are here to explore. For information about the Smith College policy on records management and retention, please see the Smith College Archives Records Management Policy.